If your child has ever asked for a pony for a birthday or Christmas present then the award winning Butterscotch Pony would make the ideal gift. Parents up and down the country have been amazed by how much their kids love this realistic interactive Fur Real Friends Pony. Butterscotch Pony is 39 inches high and can support up to 36 kg. 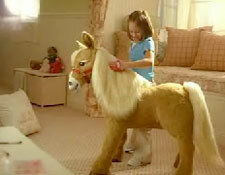 The Hasbro FurReal Friends Butterscotch Pony can fulfill every little girl's dream of having her very own pony. 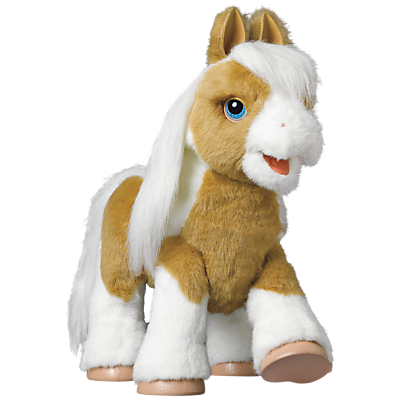 Butterscotch is a miniature Shetland pony, and will react to your child's loving care in an amazingly realistic way. More than 3 feet tall, Butterscotch will also allow kids to sit on her for a pretend ride. Recommended for ages 4 through 10, Butterscotch Pony will quickly become any little girl's most precious friend. Winner of the 2007 Toy of the Year award for Best Girls Toy of the Year.